At the end of the Second World War, Korea, which had been occupied by Japan since 1905 and annexed in August, 1910, was liberated by the victorious Allies in September, 1945. The Western powers liberated and occupied what became South Korea. Russian forces, which had been switched from the European Theatre to the Far East to attack the Japanese in Manchukuo (Manchuria), as part of the agreement reached at the Yalta Conference, ‘liberated’ the northern part of the country and quickly installed a communist government. On 25th July, 1950, The North Korean Peoples’ Army crossed the 38th Parallel and invaded South Korea. Neither the South Korean nor the American intelligence services had noted the build up of forces along the border and surprise was complete, the weak and unprepared South Korean and US forces were pushed back to the south of the country, managing to form a defensive perimeter round Pusan. General MacArthur, authorised by the United Nations, quickly sent reinforcements from Japan and the US, and also organised other countries to send men and material to bolster the South Korean (ROK) Army and help push the Communist forces back across the frontier at the 38th Parallel. A surprise amphibious landing at Inchon by US Marines opened the way to threatening the North Korean Army’s communications. A headlong retreat from Pusan was quickly followed up by the rapidly strengthening Allied forces, North Korea being invaded on 9th October. As early as August, Russia was warning the US that continuation of the war would lead to a widening of the conflict and the Chinese Communist Peoples Liberation Army (PLA) forces were concentrating in Manchuria and had moved into North Korea by September. Despite President Truman’s intervention, MacArthur’s offensive pressed on towards the Yalu River, North Korea’s border with China. 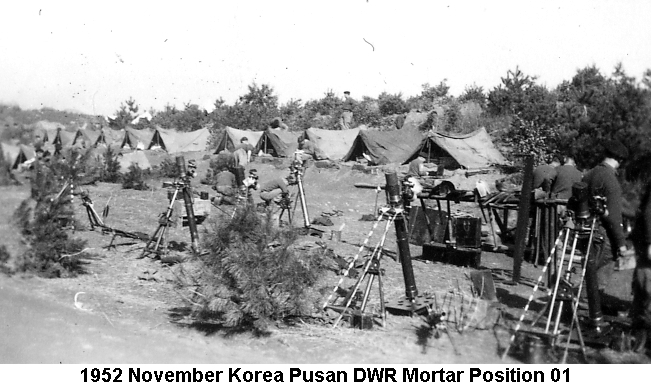 On 25th October a mixed US/ROK force was halted by Chinese troops south of Kojang. Following the Battle of Unsan the allied forces withdrew, under pressure from the Chinese and North Korean armies, to a line broadly along the 38th Parallel where the war settled down to conditions resembling the First World War, with trenches and dugouts (known as hoochies), patrols through no-man’s-land, raids and attacks while the peacemakers sat down in Geneva to work out how to end the war. The 1st Battalion The Duke of Wellington’s Regiment, stationed in Minden, Germany, had been warned off for service in Korea in early 1952. 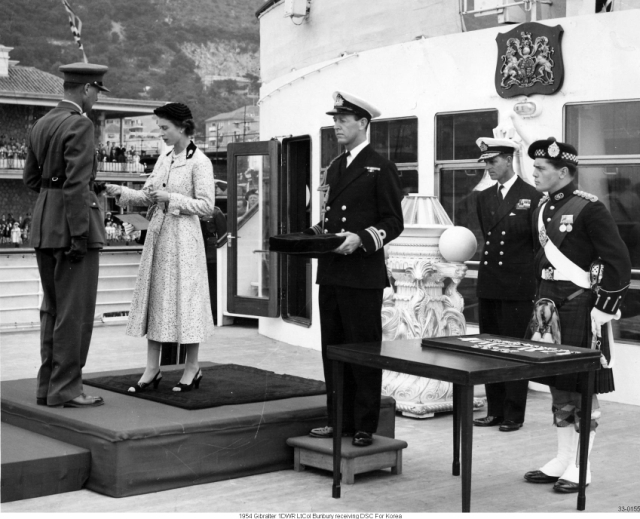 Preparations and training was carried out in Minden and Pontefract, Yorkshire, before the Battalion sailed to Korea, aboard HMT Devonshire, on 22nd September 1952, landing at Pusan on 30th October 1952. The Battalion joined the 29th Brigade and, on 16th November, 1952, the Battalion went into the line at Yong Dong, relieving the 3rd Battalion Royal Australian Regiment. After a month in this ‘quiet sector’ the Battalion moved to Naechon, relieving the Durham Light Infantry, just as the harsh Korean winter descended over the country, which made patrolling uncomfortable and difficult. The first casualty was suffered on 20th December, when Pte Kirkpatrick died of wounds. There was much more action in this sector, with fighting patrols clashing in No Man’s Land at night and a major raid to destroy a Chinese tunnel was conducted on 24th January, 1953. At the end of the month, the Commonwealth Division was pulled out of the line and a hectic round of training and field exercises was conducted. In April the Division once more went into the line and on 12/13th May the ‘Dukes’ took up positions on ‘the Hook’. A feature of great tactical importance as it controlled the entrance to the Samichon valley and through that to Seoul. It was a hotly contested feature and it had been known for some time that the Chinese intended to capture it. On 17/18th May the enemy began bombarding the position and on the 18th May a Chinese deserter brought information that a large attack was to be launched imminently. The Brigadier decided to leave the ‘Dukes’, who now knew the position and the defensive plan well, on the feature and a great deal of preparation, including bunker construction and strengthening, wiring and mining, the reconnaissance of likely enemy forming up points and many listening patrols, was carried out. On 28/29th May the final enemy bombardment fell on the Hook position and a series of fierce enemy assaults, as shown on the Hook map, managed to get into the positions held by D Company, and the entrances to many of the bunkers were destroyed with satchel charges. However, the Chinese were caught by the well planned artillery, tank and machine gun Defensive Fire (DF) tasks and the following waves were all but wiped out. A counter-attack by the Battalion reserve Company restored the situation and the Hook was declared clear of the enemy at 0330 hours. There were many examples of bravery on that night, including the tenacious defence of his section position by Private Connor, for which he was awarded a posthumous Mention in Despatches, notified in the London Gazette on 14th August 1953. This honour is signified by the wearing of a bronze oak leaf on the ribbon of the relevant medal. The ‘Dukes’ suffered 3 officers and 17 men killed, 2 officers and 84 men wounded, with 20 men listed as missing, most of these taken prisoner, during the battle. Estimates of the Chinese casualties were 250 dead and 800 wounded, largely as the result of over 38,000 artillery shells from the Divisional artillery and 1st US Corps Artillery Group. At 2200 hours on 27th July, 1953, the fighting in Korea came to an end, with the formal declaration of a truce. The war between North and South Korea, though, continues to this day, with occasional flare ups and casualties on both sides. The Battalion left Korea, after a moving ceremony at the United Nations Memorial Cemetery to honour their dead on 13th November, 1953. They arrived in Gibraltar on 10th December, where the Queen and Prince Philip, during a state visit, invested members of the Regiment with gallantry awards for their actions in Korea. Following the royal visit Franco closed the Spanish / Gibraltar border. By a quirk of fate, when the Regiment returned to Gibraltar in 1984, it coincided with the border being reopened to pedestrians.